The amount given to charity by people in Scotland rose by almost 50 per cent last year, according to figures from the Charities Aid Foundation. 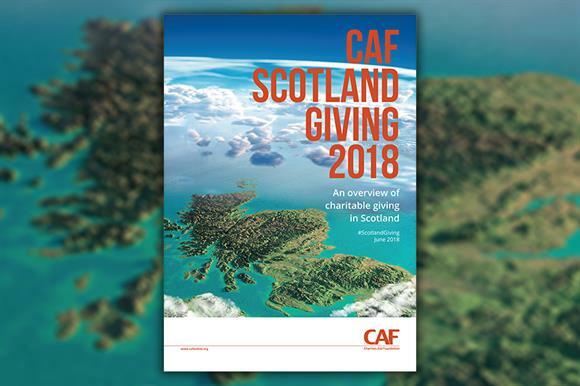 CAF Scotland Giving 2018, published today, shows that total donations to charity grew to an estimated £1.2bn in 2017, up from £813m in the previous year. But the increase was down to individual donors giving more rather than a rise in the number of people who donated to charity, the report says. Researchers found that the proportion of people who said they had made donations to charity in the past 12 months fell by two percentage points over the course of the year to 63 per cent. But the average amount given by those who took part in the research increased dramatically, CAF found. The report says that although the median donation was £20, the same as in 2016, the mean donation increased from £36 to £60. "This means that within the overall amount given, there are a number of people giving high amounts, and more so than in 2016," the report says. "While it is positive that more money overall was given to charity in Scotland in 2017, it is of some concern that fewer people gave overall. "This leads to a key policy question about how to encourage giving and whether it should focus on getting more people to give or getting those who give to give more – or, indeed, a combination of both." The report, which is in its second year, says that people in Scotland accounted for 11.8 per cent of all UK charitable donations, despite representing only 8.4 per cent of the overall population. CAF said the three most commonly supported cause areas in Scotland in 2017 were children and young people, medical research and animal welfare, the same as in the previous year. The figures are based on monthly polling carried out by YouGov on behalf of CAF with more than 1,000 adults over the course of the year. The report cautions, however, that the estimate for total giving is calculated from what is reported to have been given, so is subject to respondent reliability "as well as other considerations that apply to all surveys based on a sample of a population rather than a census". The report says that two-thirds of respondents said they had taken part in charitable or social activities over the course of the previous year, such as volunteering for a charity, donating money or goods, or buying an ethical product. It says that 56 per cent of respondents said they signed a petition in the previous 12 months, and 27 per cent had done so in the previous four weeks. "This reflects a pattern across the UK as a whole, and suggests that rapid political change has encouraged people to become more involved in causes and issues," it says. Sir John Low, chief executive of CAF, said the report showed how much people valued good causes. "It’s great to see the total amount donated increasing across Scotland," he said. "Activism is also on the rise, perhaps re?ecting the turbulent times in which we live. This paints a picture of a thriving, vibrant society of which we should all be proud."